If you happened to catch the previous post, you know that Daniel and I made our way to San Diego yesterday. Sadly, we are already heading home to Arizona. But not because we didn’t love the city. It was beautiful and seemed to have quite a bit of European influence which we are drawn to. Daniel mentioned it was very “eclectic” and he is right. Right now, we are at the airport with a few (too many) hours to spare before our flight, so I figured I would at least provide a little recap on the last 36 hours of our adventure. Let’s just say we didn’t have a lot of options in the way of food. 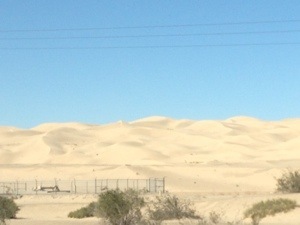 Daniel mentioned it reminded him of parts of Iraq and Afghanistan with the random palm trees and sandy terrain. I told him I’d prefer not to vacation there. 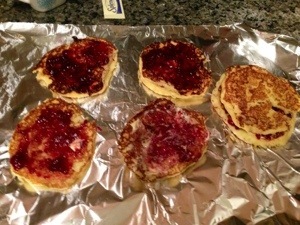 Fortunately we had the foresight to pack some snacks – just before we left the house yesterday morning I quickly made some Jiffy brand corncakes and decorated them with some raspberry jelly for my handsome chauffeur, Daniel. Okay, so it’s not “figure friendly” food, but it kept our wallets healthy at least. I also packed an apple (my go-to fruit) and two pseudo-trailmix bags: Cheerios, raw almonds, dried cranberries and a little dark chocolate. By the time we got to San Diego around three o’clock local time (four our time) we were ready to stretch our legs and get some real food. We checked into the B&B, and the owner gave us a whole list of restaurants to check out – we nearly drooled on our paperwork. We quickly dropped our bags and set out, on foot this time. As it turned out, it was like the Amazing Race trying to find a place to eat. We headed in the direction of Balboa Park where there are 16 different museums (one called The Museum of Torture – um, no thanks) plus the famous San Diego Zoo. Most importantly, it was the direction of two of the restaurants that had been recommended to us. Unfortunately, we kept being derailed by silly details like signs that said, “sorry, we’re closed on Mondays” or hostesses that said, “we’d love to serve you, but we closed at 3:00.” It was at 3:25 and the next closest restaurant closed at 3:30. We weren’t in any mood to run so we regrouped, changed our course and headed downhill to the Gaslamp Quarter – the historic heart of San Diego. Unlike the Balboa area, the Gaslamp was full of open restaurants willing to serve a couple of sad looking tourists. We opted for a Tavern where I ordered a salad that was quite good, but the picture I took made it look, well, disgusting. We hung around a while and watched a bit of the Steelers game before heading back for an early-to-bed. It was REALLY early, but we were smoked and decided that going to bed would enable us to get up early, recharged. Our strategy worked. We were wide-eyed at 6:20 this morning so we donned (yep I said it) our running attire and went for a beautiful (and brisk) 5.5 miler around Balboa park. Below is a tree that I couldn’t get enough of. How cool! 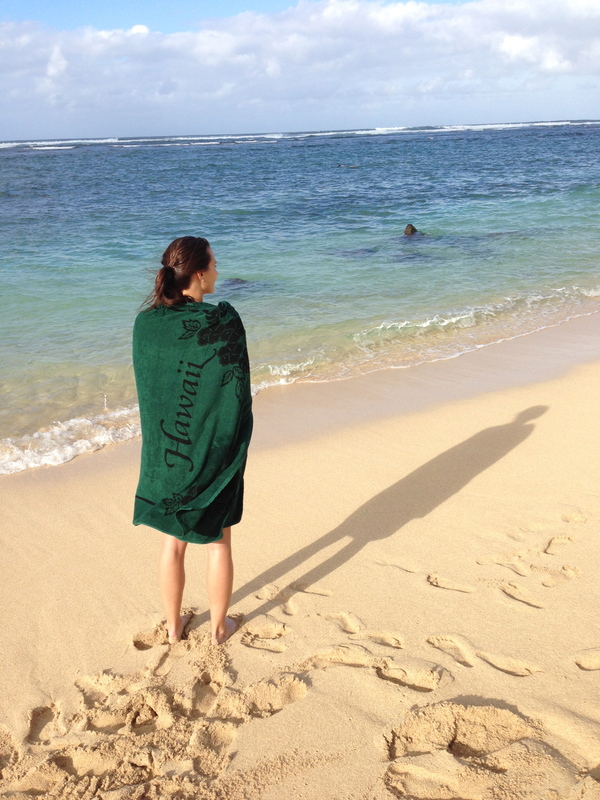 After showers we got to enjoy the benefits of the second B in the B+B equation – breakfast! 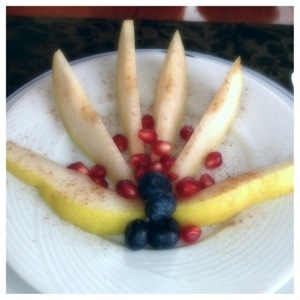 Fresh pears, pomegranate, blueberries, spinach quiche, and homemade bread. 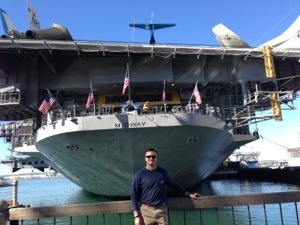 Feeling fit and fueled we set out to visit the USS Midway. We were lucky to get some huge discounts on admission since Daniel is active duty military but if you’re ever in San Diego, full price for an adult is $18 – totally worth it! We spent a couple hours on board, checking out everything from the ships’ time-out cells for naughty sailors to the lavish (relatively) Captain and Admiral quarters. We didn’t have much time to kill before heading the car depot to drop our car off. I’ll spare you the details of this obligatory part of the trip which was, um, boring. The airport food has inspired my next blog topic: Could your “healthy” salad be making you fat? Previous post ← Road Trip!